April 12, 2010 (Lakeside) –Concerns bubbled up at a Saturday meeting between Helix Water District general manager Mark Weston and residents of Lakeside over a proposed El Monte Valley mining, reclamation, and groundwater recharge project. Ninety percent of San Diego County’s water supply is imported. After nine years of drought along the Colorado River, supplies have lessened and the water itself has become more saline (salty). Meanwhile a federal court ruling has ordered a halt to delta pumping to protect fish, further restricting water supplies for southern California. Helix has proposed to take wastewater that has been gone through standard tertiary treatments and filtered with 100% reverse osmosis, hydrogen peroxide, and ultraviolent treatment. The treated water would then be pumped into ponds along the north side of El Monte Valley and seep into the groundwater basis to mix with naturally occurring water. After six months in the ground, it could be pumped from wells on the south side of the valley and sent to a treatment plant in Lakeside, where it would be treated with ozone to become drinking water. The plan would also allow sand mining in the valley a section at a time, followed by revegetation that Helix officials say would ultimately restore and enhance natural habitat for wildlife, adding hiking and riding trails and several river crossings. The project could provide five million gallons of purified water per day, up to 15% of total water demand in the District, which includes La Meas, Spring Valley, Lemon Grove, El CAjon, parts of Lakeside and Santee, and some unincorporated areas of the County. Helix has used El Monte Valley for well fields dating back 80 years, also leasing portions of land for agricultural usage. About 15 years ago, developers approached the district asking to build two golf courses. The project went awry when the economy tanked and developers couldn’t get financing after completing rough grading, so they proposed an alternative project that, under the latest revisions, would include moderate sand mining, recontouring of the valley, and complete river restoration on 500 acres. Some residents, however, remained skeptical. Residents with wells near percolation ponds would no longer be able to drink their well water, Weston confirmed, though the water would still be safe for irrigation and other uses, he said. “We estimate that about 40 families will need drinking water,” he said. Others echoed that concern. “Are we to be assessed with huge bills each month?” Milt Cyphert, president of Lakeside First, a citizens watchdog group, asked. “You could be putting people out of business here.” He added that mitigation for the project should include the District agreeing to pay for costs of providing drinking water for impacted residents. 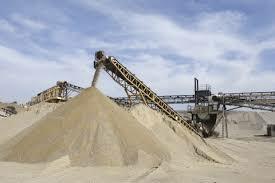 The value of sand has risen, providing a financial incentive for mining sand. Helix rejected a more drastic proposal by the developer to go down 20 or 30 feet in the middle of the river. “We said, ` You guys are crazy,’” Weston recalled. The current proposal would allow sand mining down 10 to 15 feet, to be done in phases. Invasive plants such as bamboo and tamarisk would be removed and replaced with native vegetation as each section is completed. Residents had other concerns. “Will we be left with a swamp—West Nile virus?” one concerned resident asked. Weston responded that the valley is permeable and drains fast, but that more water could be extracted if needed. Others voiced concerns over changes in water levels, noting that newly planted trees and foliage could wash away if flooding occurred in the two to five years that revegetation is predicted to take. Some residents admit to feeling under siege. Many lost homes in the 2003 Cedar Fire. Now they are battling SDG&E over the proposed Sunrise Powerlink. SDG&E has threatened to seize some lands by eminent domain, including property owned by Jody Morgan. The next step for the Helix project will be a scoping hearing in May or June, Weston said. The District will make decisions on the EIR, though the County must approve a major use permit for the sand mining. Traffic on Willow Road due to project?